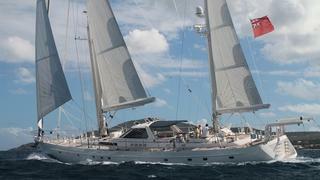 The 29 metre sailing yacht Constance, listed for sale by Toby Walker at Stockbridge Yacht Brokers, has been sold. Built in aluminium by Dutch yard Van Dam Nordia to a design by Robert Van Dam, she was delivered in 2003 as a bluewater cruising ketch and received an extensive refit in 2014. The refit saw her receive a new set of sails while her masts and rigging were also upgraded. Masts and spars are by Hall spars while Lewmar winches are used throughout. A classic interior accommodates eight guests in three cabins consisting of a master suite and two twin guest cabins, each with a Pullman berth, and all cabins have entertainment centres and full en suite facilities. Constance is a capable and reliable sailing yacht that is also very safe, strong, comfortable and practical. A huge cockpit is fully equipped for al fresco dining and entertaining at sea or when anchored while her comfortable saloon offers a 50 inch LG television screen. Included in the offer are her two tenders and a Bauer dive compressor. A single 425hp Lugger engine gives her a cruising speed of 10 knots and a range of 3,500 nautical miles at 8 knots. Her broker, Toby Walker, comments: “The ultimate family yacht for comfort, luxury, space and range. A true go-anywhere cruising vessel in immaculate, ‘as new’ condition. Refitted extensively in 2014, Constance has the volume and spaces of a much larger yacht but without the similar expenditure and costs."